But I fear there may be a few (read many) holes here. Let’s start with the generation of power. Yes, the sea is powerful, but I struggle to perceive where we are meant put these structures so as to optimize energy production and sustain the agricultural. The schematic shows intent for the garden and livestock areas to be open-air, which implies maintenance through natural rain events. The doldrums (near the equator) where rain input would be high, but wind and wave energy would be extremely variable and at times non-existent would fulfill one need but not the other. Additionally, it is not clear what mechanisms would be in place to avoid movement of the structure with the currents, which would result in extremely variable conditions and climates, most likely resulting in destruction of the open-air flora and fauna. I also struggle to understand the mechanics behind pressure stability of the structure at depth and the complicated fail-safe system that would be needed to ventilate lower levels. The idea of ‘bioluminescent tentacles’ is bizarre. It is more likely that they would be artificially lit, as true bioluminescence would require the generation of light from life. It is seemingly a bit of artistic embellishment, and shows disregard for what purpose they serve biologically. In the sunlit surface ocean, fish and other animals aggregate beneath floating mats of algae and hang around the shade buoys or ships in attempt to hide from predators, while some animals living in the darkened depths use bioluminescence as a tool to attract prey (angler fish) or even deter predators (dinoflagellates). It is outlined that these tentacles are intended to “provide sea fauna a place to live,” but outside of the euphotic zone lit areas would act as spotlights on prey and could disrupt current predator-prey interactions. 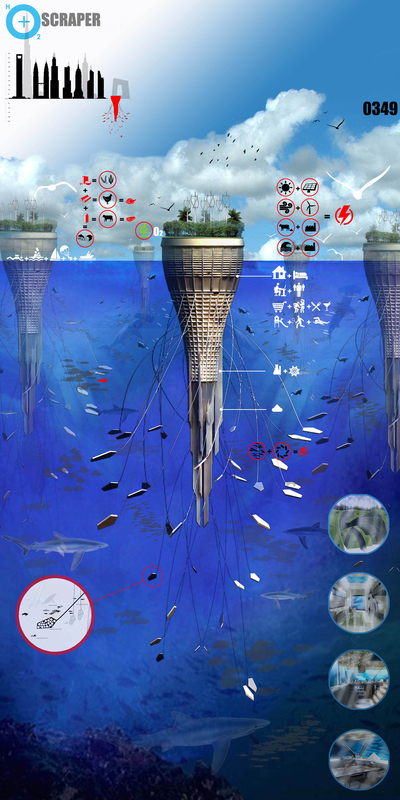 Another concept model, the sea-scraper (http://www.evolo.us/architecture/seascraper-floating-city/; see image below) intended to be situated in high current areas, such as the gulf stream, seems slightly better planned, but they outline an idea to pump the nutrient rich waters at depth to the surface to create an artificial reef system by supporting plankton growth. Whoa! Changing the biogeochemistry of the surface waters along the gulfstream through artificial upwelling is mad. Also, wouldn’t structures here be at risk 5 months of the year during hurricane season? Even if we choose to ignore those issues, we’re still talking about grouping 100s (1000s?) of people together in isolation for prolonged periods of time. Having been to sea a few times myself, I know my limit for being isolated on a ship with the same people teeters between 4 and 5 weeks. Granted a ship is small in comparison and doesn’t have all of the interesting and stimulating areas proposed in the hO2+ scraper. If we scale up for expanded entertainment and more people to interact with, I think I could handle 6-12 months here before going insane. What is the residency term intended? If this is geared towards permanent settlement, at what point do we shuffle between structures to avoid genetic bottle-necking amongst both the livestock and the residents? Additionally, imagine the controls that would need to be in place to ensure enough people to fill skill niches: doctors, engineers, farmers, etc. Would permanent residence foster the pipelining of children into forced career paths or could experts and doctors be persuaded in from the outside. There are countless other potential problems arising from current designs, but I suppose that leaves room for improvement. 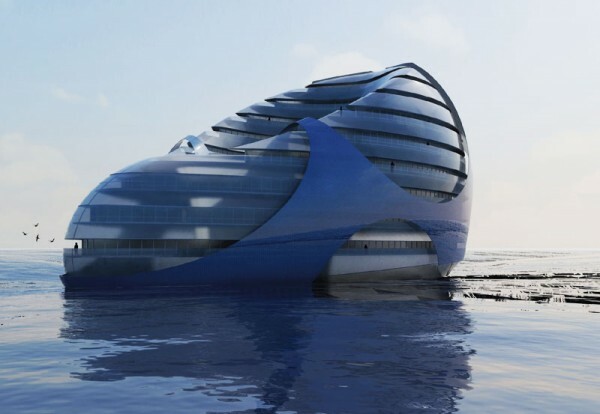 Sea/water-scrapers are an interesting concept, but if any of this is to move forward, it is time to get some oceanographers on the design team.